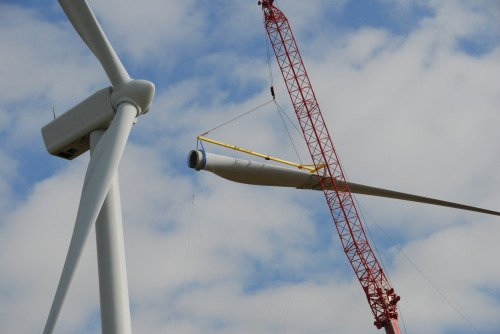 The prototype 'stealth' blade is fitted onto a Vestas V90 turbine at Swaffham Wind Park in Norfolk, UK. Adds comments from QinetiQ at the British Wind Energy Association’sBWEA31 in Liverpool on 21 October. A 44 m prototype stealth blade, manufactured by Danish wind turbine maker Vestas Wind Systems, was demonstrated for the first time at a wind farm in Norfolk, UK. The blade was jointly designed by Vestas and QinetiQ, a UK based technology provider to the defence and related markets. In the test, the stealth blade was fitted onto a Vestas V90 wind turbine and radar cross section (RCS) measurements were taken. The results showed significant RCS reductions. According to a QinetiQ spokesperson at BWEA31, QinetiQ’s RAM solution can reduce reflected energy to less than one percent. With large numbers of wind farm sites currently blocked by objections on the grounds of potential radar interference, this stealth technology could have a huge impact on wind farm planning in both the UK and the rest of the world. The technology was developed as part of a programme part-funded by the UK Government Department for Business Innovation and Skills (BIS). The goal of the five-year project was to develop stealth turbine technology that can significantly reduce the size of the radar signature made by individual wind turbines to the point where they can be effectively ‘factored out’ of air traffic control and air defence systems. The stealth turbine technology uses a range of radar absorbing materials (RAMs) which are integrated into the current manufacturing processes for turbine components (blades, nacelle and tower). The radar absorbing materials can be designed to operate at aviation and maritime frequencies and include modified composites for nacelle and blades, and RAM coatings that can be sprayed onto the tower and other static surfaces. QinetiQ said at BWEA31, that the integration of RAM requires virtually no changes to manufacturing processes and minimal mass and cost increases. Furthermore, the integration of RAM materials in the wind turbine is based on a fit-and-forget basis for the lifetime of the wind turbine. “We believe that Stealth Turbine technology could be a genuine game-changer for the renewable energy industry by removing a major barrier to its development,” says Mark Roberts, Strategic Business Director for Energy and Environment at QinetiQ. How is RAM incorporated into wind turbines? For the wind turbine blades and nacelle, the layers are produced as modified versions of normal glass cloths and are compatible with a range of composite materials and manufacturing techniques such as hand lay-up, resin-infusion and autoclave (prepreg). The RAM layer is incorporated into the sandwich structure of the wind turbine blade. A QinetiQ spokesperson pointed out that carbon reinforced wind turbine blades reflect more radar signals than a glass reinforced wind turbine blade, and that the two therefore require slightly different approaches. The wind turbine tower and nacelle can be covered in a thin coating that can be either non-magnetic and/or non-ferrous. Stealth technology is well established in the military sector. A QinetiQ spokesperson said that Vestas will now take the stealth product forward. Although the test blade was for a V90, there is no reason why stealth technology could not be applied to for example the V100 wind turbine, although it may have to be customised slightly. If another wind turbine producer wants to use the technology, further adjustments may have to be made, QinetiQ said at BWEA31, as different manufacturers use other materials and have different designs. Ideally, stealth technology should be incorporated into the design stage of wind turbines, and from what Renewable Energy Focus could understand, there are plans to do this together with Vestas. The QinetiQ spokesperson said there is no single mitigation solution to solve all the problems related to radars and wind turbines, but that “stealth can solve a lot of cases alone.” If combined with special software at the radar, the problem could be further mitigated.